We had no idea how great a lad Alex Oxlade-Chamberlain was before he came to Liverpool, or how talented a footballer he was, either. The Englishman would be starting under Gareth Southgate at this World Cup if it wasn’t for a horrible injury picked up against AS Roma in the Champions League that decimated his season and will keep him out of action until almost the New Year. 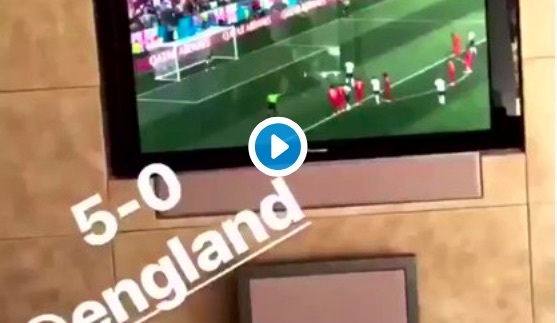 But despite this, Ox is still enjoying England’s performances in Russia and uploaded some great videos to his social media accounts during yesterday’s mauling! The first shows him singing ‘Football’s Coming Home’ after John Stones makes it 4-0, and the second shows him hobbling around in his knee brace when Harry Kane slammed in a penalty for 5-0! Liverpool fans don’t usually have much time for England, but it’s impossible not to be engulfed by World Cup fever right now. We’re loving it, and we’re glad Ox is too. We just hope his recovery is going as well as expected.